Herby Everything Cheddar Swirl Buns. 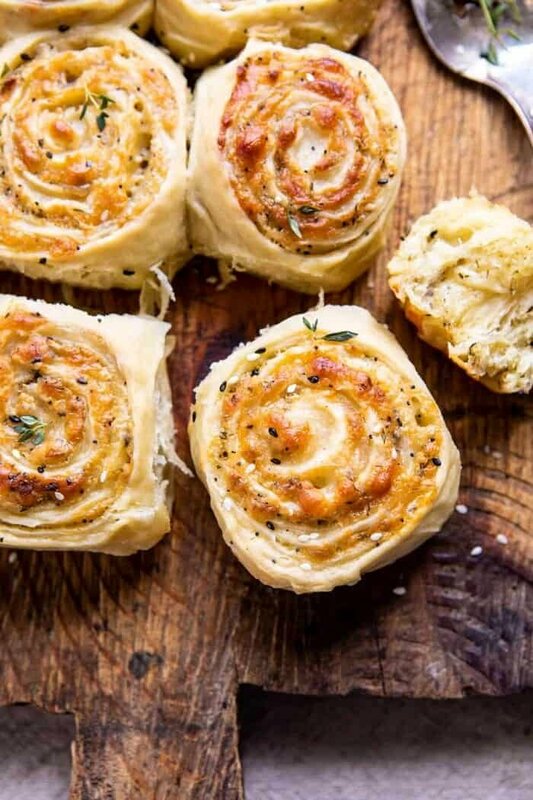 Herby Everything Cheddar Swirl Buns. Is there anything better?! 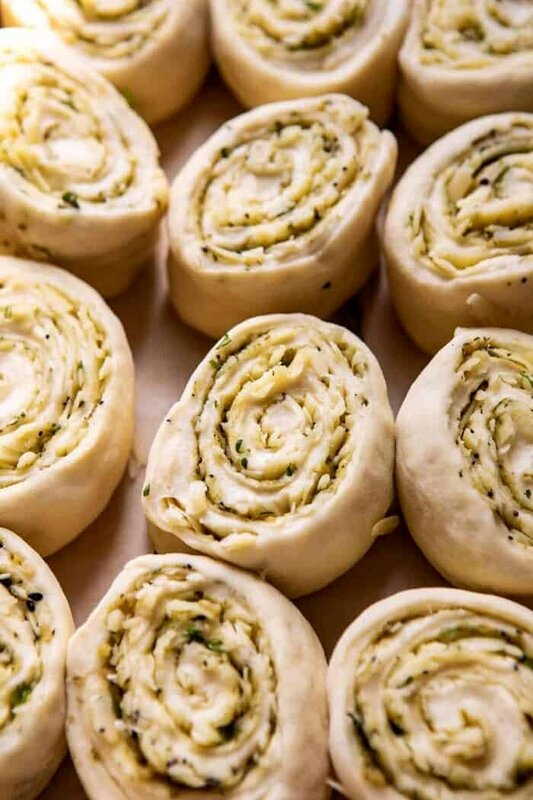 These rolls are easy, doughy, swirled with cheddar cheese, basil pesto, fresh herbs, and a little everything bagel spice too. Serve at your next family gathering as an easy brunch, appetizer, or even as a side dish. 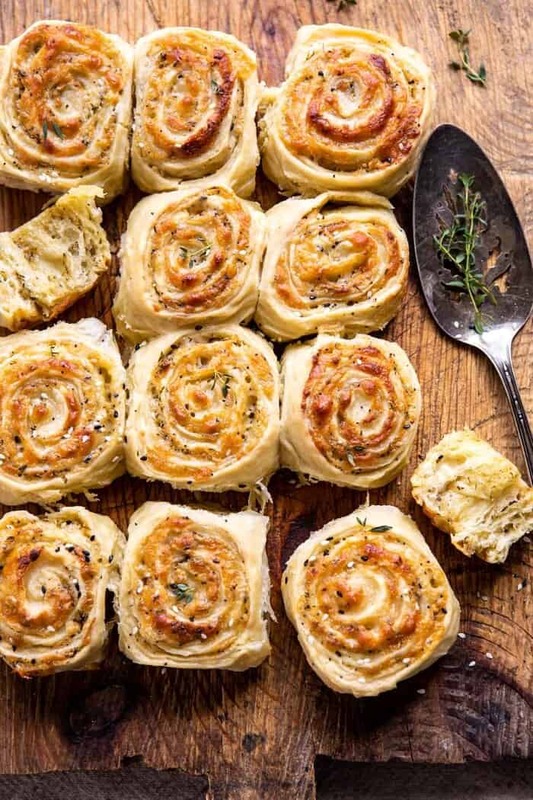 Everyone will love these fun (cheesy) and pretty swirl buns…perfect, springy and DELICIOUS! 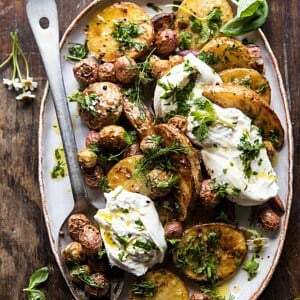 There are three things I seem to be really into right now – fresh herbs, everything bagel spice, and recipes geared towards Easter entertaining. I’m sure you’ve all noticed my major obsession with herbs. Honestly, it’s been going on since about this time last year. I haven’t gotten even the least bit tired of creating new recipes with fresh herbs. They add so much flavor and color to even the simplest of recipes. The everything bagel spice? Well, I seem to get hooked on this spice blend every time the spring and summer months roll around. Anyway, these swirl buns have a funny story. I mean, kind of. Nothing that comes out of my mouth is ever very “funny”. I just don’t seem to have that funny bone in my body. Here’s how these buns came to be. Every night I set aside a good chunk of time to go through ALL of my Instagram messages, look through the photos of recipes everyone’s made, and do my very best to respond to you all. It’s honestly one of my favorite things to do, I’m always so bummed if I have to miss a night. 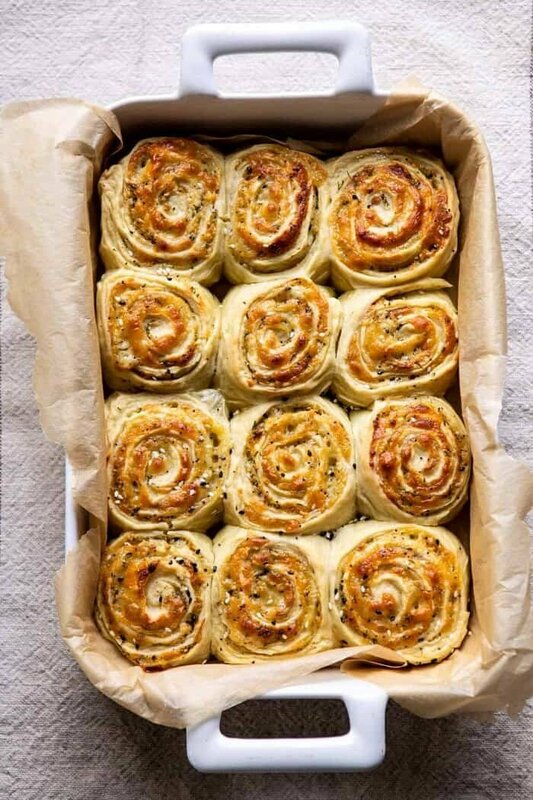 One night a couple of weeks ago, someone had tagged me in their story, showing me a cheddar swirl roll they’d made, and informing me how much they loved my recipe. At first, I thought how good the rolls looked, and that I was so happy they had enjoyed the recipe! A few hours later though, my thoughts rolled back to that photo. I thought to myself, wait, what recipe was that? So I searched the site, and unfortunately confirmed my unease…I didn’t have a cheddar swirl bun recipe. I have so many recipes here on HBH (2067 to be exact), sometimes I can forget that I’ve made something. However, I now know for sure that I have not made a cheddar swirl bun. My thought is that this very kind reader just got me confused with someone else. 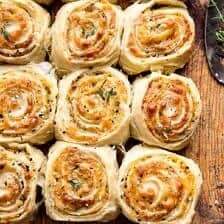 BUT, I am so thankful, because once I realized that I had zero cheddar swirls roll recipes, I knew I needed to make one. And as soon as possible, because how perfect will these be as an Easter brunch bun or appetizer? Yum. I like to use my favorite, super simple bread dough recipe as the base for the rolls. It’s literally just milk, flour, eggs, and butter. Simple, but it’s a great, extra soft and doughy base. The filling is really what we need to talk about though, it’s so flavorful. For one, there’s basil pesto. Yes, I might use basil pesto in one too many recipes but I find it really adds so much. Two, there’s cheddar cheese. Now, I have not once met a person who does not love cheddar. It’s easily one of the more likable cheeses, and it pairs especially well with…. Everything bagel spice…oh how I love this flavor combo! It’s a mix of sesame seeds, onion, and herbs, and if you love the classic everything bagel, then you’ll love this spice. Spread the pesto all over the base of the dough. Then add the cheese, everything spice, and a pinch of fresh thyme. Next step is to roll up the deliciousness, just as you would a cinnamon roll, then slice into buns, and let rise. At this point, you can either keep the buns in the fridge overnight and bake them off in the morning. OR you can simply bake them right away. Either option is great. As soon as the swirl buns come out of the oven, serve them! These are definitely a roll that’s best to eat warm. They’ll be soft cheesy, and smelling beyond good. You must make these buns! Sorry, best line I can come up with at the moment. My brain is a little all over the place, but it’s still true! 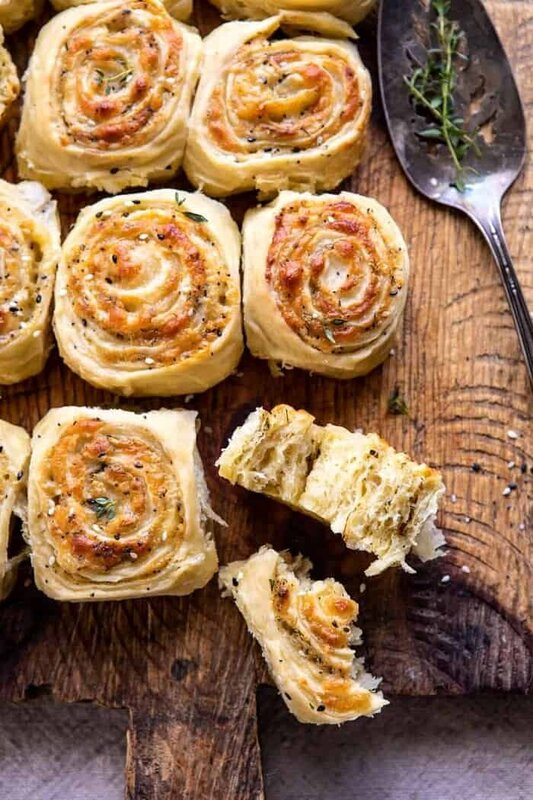 You need a cheesy, herby swirl bun in your life this spring. Maybe as a mid-week treat, or for Easter dinner, a Mother’s Day brunch – whatever. Just make them and enjoy! If you make these cheddar swirl buns, be sure to leave a comment and/or give this recipe a rating! Above all, I love to hear from you guys and always do my best to respond to each and every comment. And of course, if you do make this recipe, don’t forget to also tag me on Instagram! Looking through the photos of recipes you all have made is my favorite! Easy, doughy, swirled with cheddar cheese, basil pesto, fresh herbs, and a little everything bagel spice too. 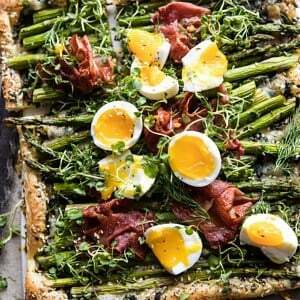 Serve as an easy brunch, appetizer, or even as a side dish...perfect, springy and DELICIOUS! 1. In the bowl of a stand mixer, combine the milk, yeast, honey, eggs, butter, 3 ½ cups flour, and salt. Using the dough hook, mix until the flour is completely incorporated, about 4-5 minutes. If the dough seems sticky, add the remaining ½ cup of flour. 3. Meanwhile, make the filling. In a small bowl, combine the cheddar, thyme, everything bagel spice, and crushed red pepper flakes. 4. Preheat the oven to 350 degrees F. Line a 9x13 inch baking dish with parchment. 5. Lightly dust your work surface with flour. Turn out the dough, punch it down, and roll it into a rectangle about 10 x 16 inches. 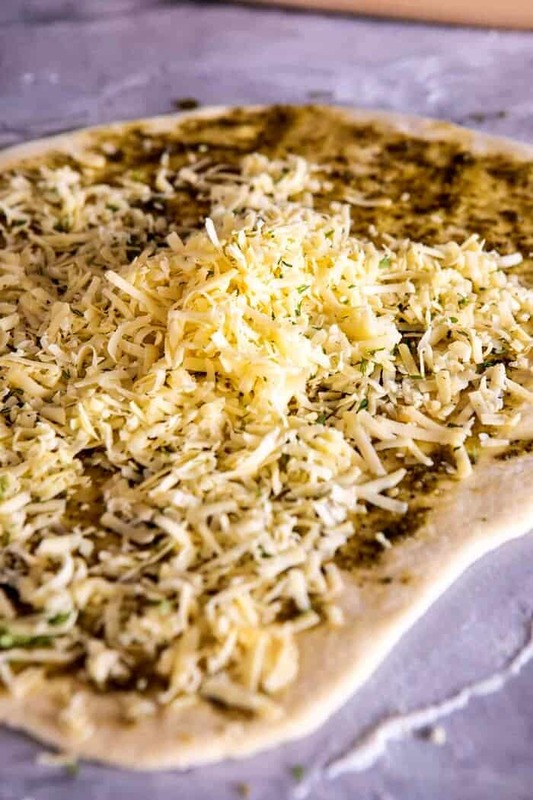 Spread the pesto evenly over the dough. Sprinkle the cheddar mix evenly over the pesto, lightly pushing it into the pesto. Starting with the long edge closest to you, carefully roll the dough into a log, keeping it fairly tight as you go. When you reach the edge, pinch along the edge to seal. Using a sharp knife, cut into 12 rolls. Place the rolls in the prepared baking dish. Cover with plastic wrap and let rise 20-30 minutes. Alternately, you can let the rolls sit in the fridge overnight. 6. Bake the rolls for 20-25 minutes, or until the cheese is bubbling. Serve warm and enjoy. I’ve literally just died here! These look incredible, and are definitely going to the top of my list of things to make ASAP! Oh don’t these look inviting! Perfect for Easter and beyond! ABSOLUTELY perfect! 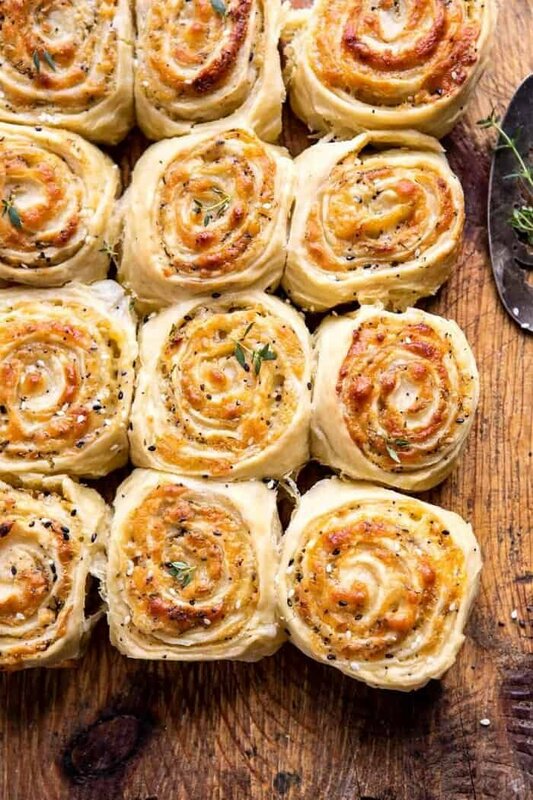 These savory rolls are a must for any Brunch or get-together coming up, especially Easter. What a fantastic idea to use the pesto as a base for everything. I’ve gotta try these. 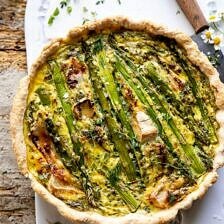 Love your unique recipe ideas! Thanks for sharing. Great combo. Love cheddar and with you would use it more frequently. Oh my Lord, these sound perfect! You could mix it up with different cheese, maybe add a sprinkling of crumbled, cooked bacon …. What a great idea! Thanks once again for the inspiration! Your ideas have literally never failed me yet in all these years! 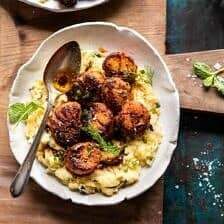 Love the looks of this recipe. I’ll give it a try using frozen bread dough. Thanks for the inspiration. These look amazing! Can’t wait to try them as a side with soup or …maybe just for a snack! How long will these keep and what is the best way to store them to keep them fresh? I will be *testing* these for Easter that’s for sure! I have one question first though- I’ve made your cinnamon brioche rolls from the cookbook about 4 times now. The first time I did not rise overnight in the fridge and they turned out beautifully. The next 3 times, out of sheer stubbornness, I tried to rise overnight in the fridge but all 3 times they turned out icky…they did not rise, they were thin, they didn’t brown in the oven, just sort of stayed the colour of the dough, and tasted very doughy. I follow the recipe exactly and cover with cellophane and put them in the fridge (at 4 degrees) and let them rest for a half hour at room temp before baking. What am I doing wrong? Should I just give up on the fridge? Thanks! Hey Jess! Is your fridge 4 degrees or 40 degrees? If 4 degrees, that is way too cold for the rolls, but my guess is that your fridge is more like 40! I am super confused as to why your rolls are not rising. What brand yeast and what variety of yeast are you suing? Hoping you can help! So sorry for the trouble! These look amazing! But what size yeast packet do you use? I have 7 gram packets – is that enough, not enough?? Thanks! I love this idea and I’m also wondering if I could double the basic dough for a pan of cinnamon rolls for breakfast….! Ohh these looks so delicious, I’m pinning them for sure. But when I click on the link of the everything spice recipe, it leads me to the grilled cheese recipe. And if I click on the everything spice link there, it leads me back again to the grilled cheese! Is it possible to fix that please? Thank you! I see now that the link in your text that leads to the heirloom tart does lead me to the recipe of everything spice. So if got it now. ;-). But still, I wanted you to know about the other links I mentioned. Definitely adding these to our Easter brunch menu. Thanks Tiegan! Can they stay in the fridge for 24 hours? I’d like to make them tonight for a party tomorrow… so they’d be in the fridge almost full 24 hours. Would I take them out for a bit before baking them? Then turned them into Smokey pesto turkey sandwiches. I may try using a smoked garlic horseradish instead of pesto to make a killer beef sandwich next! What’s the weight of 1 packet of instant yeast? These buns are everything! 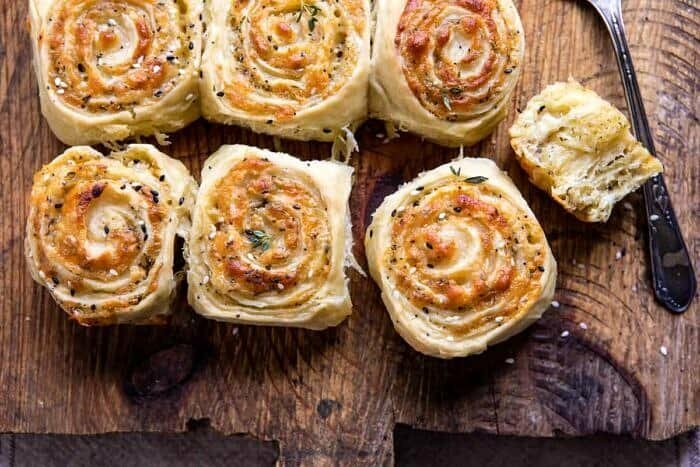 Love the cheesy swirls! Im so excited to try this recipe this week! I have a silly question 🙈 – would I be able to swap the thyme for another herb like rosemary? Would you need to alter the recipe at all if you used buttermilk? I loved this idea and made them today. They did not turn out well. I used 4 cups of flour and rolled the dough out to 10*16, however I found the layer was a bit too thick, no doubt when they came out of the oven, the first bite did not reach the spiced and tasted plain. Also, the cheese never bubbled…. I used bread machine for the mixing part. Next time will try less flour. Even better than the bakery! My very favorite flavors together 🙂 thanks for the great recipe!! What changes would you suggest for using active dry yeast instead of instant? These looks amazing, I can’t wait to try. I want to make these for Easter! Do you think I could make them and freeze them? Will they reheat ok? LOVE!! I made these last week for a girls night in and everyone loved them. My husband devoured the leftovers and said they are one of the best things I’ve ever made. Making again for a group of friends coming for dinner tonight. Thank you! If I’m lacking time to do the homemade dough, can I use store-bought? Ugh, but I might have to! Do you think a mild cheddar and fontina cheese would be a good combination for these???? Amazing recipe! I made them this weekend and they are such a crowd pleaser. I had to bake them quite a bit longer than stated in the recipe, but my oven is finicky. I got all the ingredients for this but forgot the milk! 🙁 is there anything I can use to replace it? TIA! If we don’t have time to make the dough, what is something pre-made/store bought that you recommend? ?